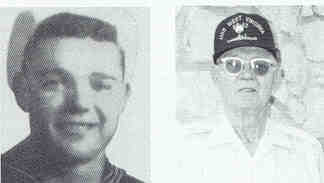 Martin J. Akin, born Dec. 9, 1925, Summerfield, KS, completed high school and joined the USN March 5, 1944. Originally stationed at Farragut, ID, then to Bremerton, WA, where he was assigned to the USS West Virginia. Akin was a gunner on #4 20mm gun and transferred to #1 gun two weeks later. He remembers when #3 gun was wiped out by a Japanese suicide plane. He was discharged in May 1946. He lives with his wife Esther in Axtell, KS. They have four children, 12 grandchildren and three great-grandchildren. He went into farming, then owned a construction company and retired in 1987.